Your vehicle's automatic transmission has been designed to make your life easier, but it is a very complicated component. Luckily, servicing an automatic isn't nearly as complicated. However, you do want to make sure that you are giving your transmission what it needs if you expect it to perform. Clean transmission fluid and a new fluid filter will keep your transmission running strong for many miles. Every automatic depends on transmission fluid to switch gears and send the engine's power to the wheels. Without fluid, the transmission will not function, and your car will not move. The transmission not only needs fluid in general, but it needs the proper amount of fluid and in turn proper transmission fluid pressures. 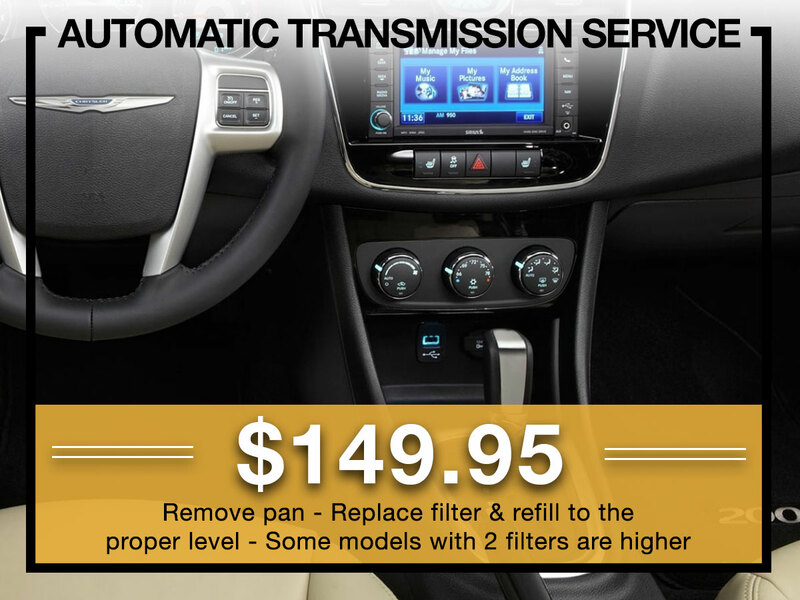 The transmission is a sealed system, and you should not lose fluid unless there is a leak. However, the fluid gets hot and starts to deteriorate causing it to lose chemical properties that the transmission relies on. Heavy use such as towing, all-day city driving, or a long commute can make this process happen faster. Servicing an automatic or manual transmission is relatively similar. The old fluid is drained out and disposed of properly. The transmission pan is removed so that the filter can be removed and replaced. While the transmission pan is off, your technician will inspect the bottom of the transmission and the fluid pan for any signs of damage, excess wear, or obvious issues. Issues like metal shavings in the pan can indicate that there is a mechanical problem inside and further inspection is needed. Always pay attention to manufacture recommendations when it comes to servicing your transmission. Your owner's manual is the best source for transmission service intervals and all other vehicle information. Manufactures may recommend transmission work anywhere from 30,000 miles to 100,000 miles, so you want to be aware of what the designers of your make and model recommend. Also important to note, is that heavy use of a vehicle warrants service sooner. If you put more than 20,000 miles on your vehicle in a year, it is considered heavy use. If you consistently use the vehicle to tow or haul heavy loads, this is also considered heavy usage, and you will want to compensate by changing your fluids sooner. Your local experts at John Amato Chrysler Dodge Jeep Ram in Glendale are qualified to work on all makes and models. Our service department is proud to host industry-leading technicians and a comfortable facility that is oriented around you having a good experience. Call to make an appointment today.